OFFICE, BARBER SHOP, APARTMENT BUILDING, HOUSE, PARKING LOT W/OFFICE BLDG. 2 Story German Brick w/cut stone foundation, shingle roof and brick pavers. 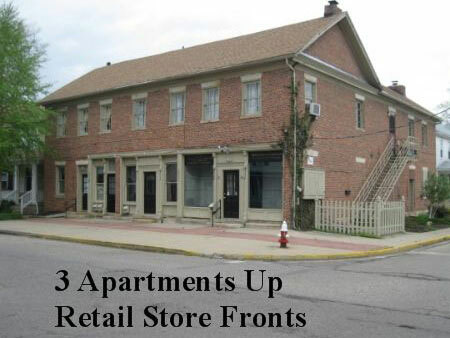 331 North High Street: Corner retail front store; hardwood flooring, can lights & tract lighting; restroom w/2 access doors on High Street and 1 access door on arch plus rear of building access. Previous rent : $2,200/mo. 335 N. High St.: Utilized as Barber shop w/restroom, barber sink, nice woodwork throughout & gas fireplace; previous rent $600/mo. All Units have separate utilities: Heating/cooling, water, gas & electric services. 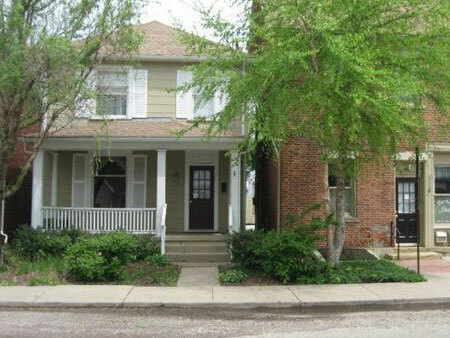 337 North High Street: Being a nice 2 story home w/hardwood floors, front covered concrete porch, living room, dining room, kitchen; Upstairs: 3 bedrooms and full bath; basement and off street parking. 336 North High Street: Northwest corner of High & Arch Streets consisting of asphalt paved lot w/block 1 car garage/office building w/restroom, air conditioning and heat; projected rent $600/mo. Real Estate Terms: $100,000 Minimum Bid; $12,500 down at time of sale in cash or check; positive ID; no buyer contingencies exist; sold as-is where-is w/all faults, offered free & clear prior to closing on/before August 22, 2011; tenant rights apply to the 3 upstairs apartments; taxes prorated closing; All information provided is to be utilized only as a guide. Buyers are responsible to conduct any inspection, inquiry, investigations and due diligence regarding to property. Buyer agrees and understands that the seller makes no warranties or representations of any kind either expressed or implied as to the condition, quality, and merchant ability of fitness for a particular purpose of the real estate or any part thereof and/or serviceability for the same. Buyer is buying property subject to any and all easements, leases, covenants and restrictions. The agreement of auction is solely between buyer & seller. Stanley & Son, Inc. and its agents are exclusive agents of the seller. Any announcements made only by the auctioneer from the podium during the time of auction will take precedence over any previously printed material and/or any other oral statements made or implied. No liability exists regarding the information contained in any printed matter for its accuracy, errors or omissions. Bidding is open, just call out, raise your hand or watch the ring personnel…they will assist you and try to get answers to any questions you may have prior to bidding. The Auctioneer reserves the right to deny admission to the auction to any person the Auctioneer deems to be noncompliant with the rules and terms for the auction or a potential threat to be such. The Auctioneer further reserves the right to bar such person from all future auctions conducted by the Auctioneer. With regard to personal property at an auction: The Auctioneer and staff have arranged the merchandise for the auction and directs that it not be altered, moved or disturbed in any way by any person other than normal inspection at the spot where the merchandise is located. The auction staff will assist anyone who has a question or request about a lot or item. In the event any person other than a member of the auction staff is detected altering, moving or otherwise disturbing any merchandise, that person will be required to immediately leave the auction, not return and, at the discretion of the auctioneer may be barred from future auctions. Any instance of theft or vandalism will be prosecuted to the fullest extent of the law. Statute of Limitations: Any action or suit of any kind must be commenced within one year from the date when the cause of action or suit occurred or it will be forever barred. The Right of Action or suit will begin to run on the date of breach, damage or injury is sustained & not when the resulting cost, damage, harm or loss is discovered. This Agreement will be exclusively construed & governed in accordance with the laws of the State of Ohio, without regard to its conflict of Laws Principles. The exclusive jurisdiction & venue for any controversy or claim between the parties shall be the State of Ohio, County of Ross, City of Chillicothe, by binding arbitration.